Abstract: Radiated field strength measurements at open area test sites (0ATS) require a non-conductive table to support the equipment under test (EUT). Broadband field strength measurements were performed using tabletops of different materials and thicknesses to investigate the influence of the dielectric properties on the measured field strength. Differences of 10 dB were recorded between fibreglass and wood. Significant differences were also recorded for different woods. It is shown that the differences in the dielectric materials used for the OATS table adversely effect measurement reproducibility between test sites. It is recommended that the dielectric properties of the EUT tabletop be adequately defined in the standards. The proliferation of high-speed digital devices operating at ever increasing frequencies has resulted in high levels of unwanted emissions that can cause harmful interference to communications and other electronic devices. In order to protect the Radio Frequency (RF) spectrum, governments in most countries have regulated to limit the amount of Electromagnetic Interference (EMI) that electronic devices may emit. Compliance is established by testing to EMI standards such as CISPR, ANSI or VCCI. These standards define Radiated field strength measurement methods and/or limits for the level of radiated electromagnetic emissions. Products must comply with the radiated field strength limits for EMI before they can be legally sold so accurate, repeatable and reproducible measurements are of paramount importance to manufacturers, suppliers and regulators. These measurements are taken at an OATS where the EUT is placed on a non-conductive table and the radiated emissions measured with a field strength measuring antenna at a typical distance of 3 or 10 metres. The same OATS is specified for measuring the radiated power of intentional low power RF transmitters. The standards require the validation of the OATS prior to carrying out formal compliance measurements. The validation of the OATS is performed by checking that the measured Normalised Site Attenuation (NSA) lies within +/-4dB of the theoretical NSA for an ideal test site. When NSA measurements are carried out, two non-conductive antenna masts are normally used, but the EUT table is not included in the measurement configuration. The implication of this is that perturbations due to the EUT table are not included in the site validation and the impact of the dielectric material on the radiation properties of the EUT (and consequently on the measurement reproducibility) is not known. Adherence to the table and EUT geometry specified by the standards, minimises some of the causes of poor reproducibility, however, the dielectric effects of the different (non-conductive) materials and thicknesses used to construct the EUT tabletop are not considered. It is clear then that if the dielectric performance of the EUT table is not adequately defined by the standards, then disputes between test houses and regulators may arise when a product’s compliance is called into question. There is often poor correlation of Radiated field strength measurements between different OATS, even though identical EUT configurations are used. Many site to site measurement comparison studies have been performed using constant level site sources. These studies have often found that large measurement differences exist between different test sites. A proficiency test involving 20 EMC Test Houses in the Asia-Pacific region was carried out by the National Association of Testing Authorities of Australia (NATA) . A Comparison Noise Emitter (CNE) with a stable output (+/-0.2 dB) was circulated and each participant measured the radiated field strength at the OATS at distances of 3 and 10 metres for both polarisations at specific frequencies between 30 to 1000 MHz. That study identified variations of over 10 dB in the measured field strength between some laboratories. While undertaking measurements for the NATA proficiency test, it was observed that measurement repeatability was poor at high frequencies. Some basic investigative tests with different thicknesses of wood confirmed that the table dielectric was the major cause of the apparent measurement repeatability problems. A previous study  by Alessandro Beggio, Giancarlo Borio, & Riccardo Enrico Zich also observed similar high frequency effects associated with the dielectric table in the performance of radiated immunity testing to the commonly used standard, EN61000-4-3. Most EMC laboratories performing radiated field strength measurements at open area test sites (0ATS) use a wooden table to support the equipment under test (EUT). The use of common plastic garden tables is also common. Some emission measurement standards specify a “non-conductive” table while others specify a “non-metallic” table. The dielectric properties and the thickness of the EUT table are not defined so it is to be expected that variations will exist between test sites in the materials used in the construction of the table. The relative permittivity varies between different types of wood and other non-conductive materials so the effect on the radiation properties of EUT sources placed on the table, will also vary. The major impact on radiated field strength is therefore expected to be on high frequency sources and on radiating sources, such as EUT cables, that are in close proximity to the dielectric. Radiated field strength measurements were performed at a NATA accredited and FCC registered OATS meeting the requirements of CISPR16-1 , CISPR 22 , CISPR 13 , CISPR 11 , ANSI C63.4 , and VCCI  for NSA. Different tabletops of 1.0m x 1.5m constructed from different dielectric materials and thicknesses were used for the study. 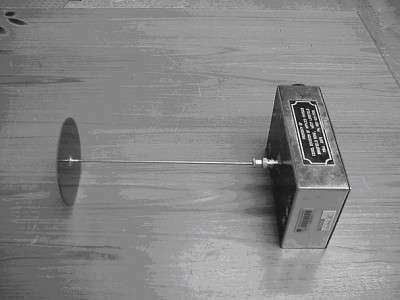 A small constant level comparison noise emitter (CNE) was placed on each tabletop and aligned to transmit horizontally polarized fields. The receiver antenna was scanned in height from 1m to 4m with the EMI receiver set to the peak detector and maximum hold mode. The field strength plots associated with each tabletop, over the range of 30 to 1000 MHz were then compared. Measurements were also performed with a swept frequency sinusoidal signal driving a dipole antenna placed on the different tabletops. The calibrated measurement antenna was mounted on a remotely controlled adjustable height non-conductive antenna mast. The measurement equipment and personnel were located in the laboratory building some 45 metres from the measurement antenna. CISPR 11, 22, 16-1 and ANSI standards recommend a “non-conductive” table while CISPR 13 recommends a “non-metallic” table. The standards do not specify the type of material or its thickness. Wood is most common but some test houses use other materials such as plastic, fibreglass or bakelite. For this study, a range of different materials of different thicknesses was used to construct an EUT table top of 1.0m x 1.5m. The permittivity of each sample was measured with an HP85070A Dielectric Probe Kit and an HP8753ES Network Analyser. The measured dielectric values are shown in figure 1. Not all dielectrics were tested but are included here for reference. Top Hat CNE Antenna. This was the standard antenna supplied with the CNE. It consisted of a metal rod with a 13cm metallic disc at the end. The disc is intended to increase the transmit efficiency at the lower frequencies. When the CNE is laid flat on the turntable, the rim of the top hat is in contact with the EUT table dielectric and the rod is 6.5 cm above the surface of the table. Monopole CNE Antenna. The Top-Hat antenna was replaced with a standard, solid copper monopole antenna with no top-loading element. The use of the monopole meant that no part of the antenna was in direct contact with the dielectric table. DB4 Dipole Antenna – Swept frequency source. The CNE was replaced with an EMCO 3121C DB4 dipole antenna with its elements fully extended and driven by the tracking generator. It was placed directly on the EUT table which meant that the radiating elements were positioned about 1.5cm above the surface of the dielectric. The sweep speed of the receiver was selected so that it was much faster than the antenna mast height scan rate. The receiver peak detector was set to max-hold and the antenna mast slowly scanned over a height of 1 to 4 metres. This procedure constructed a trace of the maximum field strength over the range 300 to 1000 MHz. It was repeated a number of times to ensure that the measurements were repeatable. The trace was plotted as field strength versus frequency and the process repeated for the different EUT table materials. A high level of relative accuracy was maintained by ensuring that nothing was changed or disturbed during the changeover of the EUT material. The position of the transmit dipole was exactly the same for each scan of each material. * Site imperfections due to discontinuities in the ground plane conductivity, reflections from nearby objects etc. * Impedance mismatch between antennas, cables, pre-amplifiers etc. No attempt was made in this study to determine the absolute measurement accuracy since the aim of the measurements was to directly compare results for each setup. When each of the factors above is considered, it is seen that for relative measurements performed over a very short time interval, the measurement uncertainty is virtually eliminated. Further checks were performed by repeating each measurement at least three times and closely comparing all traces for the entire scanned frequency range. The relative field strength measurement accuracy was estimated to be better than 0.5 dB. This is a factor of 10 times (in dB) better than the typical test house measurement uncertainty for radiated field strength. A large number of different set-up configurations were tested but only those that exhibited the major effects are reported here. Only the horizontal polarity was investigated since the most significant effects of the dielectric were observed in this position. Results are presented for the range 300 MHz to 1000 MHz. Effects above 1000 MHz were not investigated and may be the subject of future studies. Air Dielectric versus 3mm Fibreglass. Figure 3 shows the results for a driven DB4 dipole. There is a slight difference of less than 1 dB over the range of 650 to 750 MHz when comparing the readings from a fibre glass table top against the readings obtained with the table top absent, i.e. Fibreglass dielectric versus air dielectric. This is to be expected since the dielectric loading of a 3mm layer of fibreglass would be low. Unfortunately, the permittivity of this material was not measured but the expected value would be less than 1.5. Air versus Plywood Dielectric. 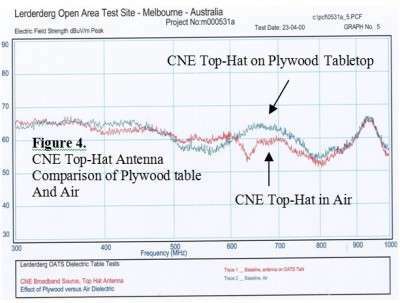 Figure 4 shows the differences in the measured fields when the CNE with Top-Hat antenna was placed first on the plywood table and then in the air. Significant differences were measured at frequencies in the range 500MHz to 850 MHz. The worst case was about 5 dB at 640 MHz. The Top-Hat antenna was in contact with the plywood dielectric surface. 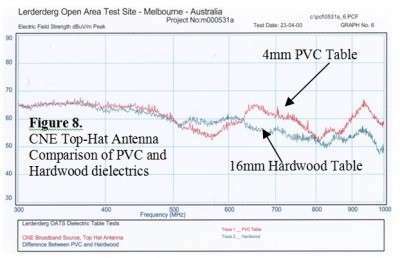 The increased field strength for plywood over the 600 MHz to 800 MHz range can probably be attributed to the interaction between the plywood dielectric and the Top Hat antenna. 3mm Fibre Glass versus 16mm Plywood. Figure 5 shows that the loading of the DB4 transmit dipole is quite severe when changing from fibreglass to a plywood tabletop. The difference between 16mm plywood and 3mm fibre-glass is 9 dB at 900 MHz. The effects were significant above 760 MHz. 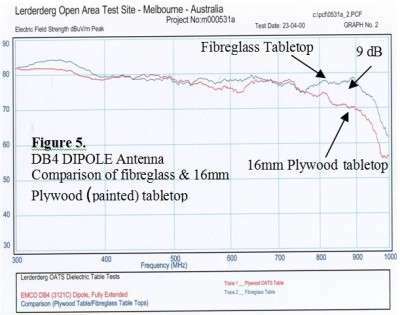 A slight effect was also observed at 350 MHz and 600 MHz where the measured field strength for the plywood tabletop was 3 dB lower than for the fibre-glass tabletop. Plywood versus Ash Hardwood. Figure 6 shows the results for the CNE with Top Hat antenna. There is a significant decrease in the radiated fields when the 16mm plywood table dielectric is replaced with a 16mm Ash hardwood dielectric. Between 900MHz and 1000 MHz, the hardwood results in fields of around 6 dB lower than the same thickness of plywood. The effects commence at around 650 MHz. 16mm Ash Hardwood versus an extra layer of 16mm plywood on top of the 16mm hardwood. 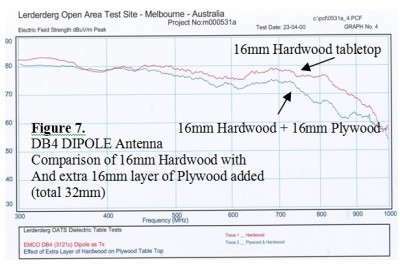 Figure 7 shows that when the DB4 dipole is placed on the 16 mm hardwood table and then an extra layer of 16mm plywood is added, the dielectric loading of the transmit antenna causes significant differences for most of the 300 to 1000 MHz band. The largest perturbation of the transmitted fields is around 10 dB in the region of 800 MHz. Ash Hardwood versus PVC. 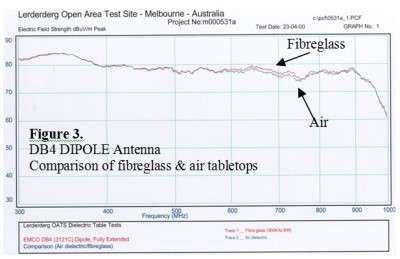 Figure 8 shows that the there were significant differences in the perturbations of the fields from the CNE top hat antenna when the dielectric table was changed from 4mm PVC to 16 mm Ash Hardwood. The PVC table gave levels of around 10 dB higher at around 650 MHz and 950 MHz. CNE Top-Hat Antenna replaced with Monopole Antenna. 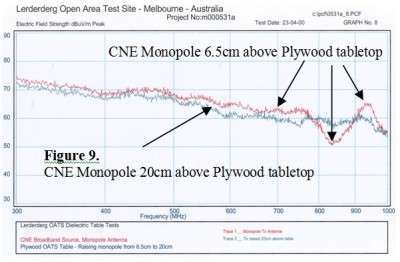 Figure 9 shows the field strength measurements obtained first with the CNE on the plywood table and then when the CNE was raised to 13.5 cm above the plywood table. This effectively increased the CNE monopole antenna from 6.5 cm to 20 cm above the plywood dielectric table. The loading of the monopole antenna appeared to have minimal impact at 20 cm while a peak and a trough occurred when the monopole was at a 6.5cm height above the plywood dielectric surface. This study investigated the influence of the dielectric material used to construct the EUT tabletop at a NATA accredited OATS. The results showed that the recorded field strength levels were significantly affected by the dielectric properties of the EUT tabletop, the effect increasing with frequency. 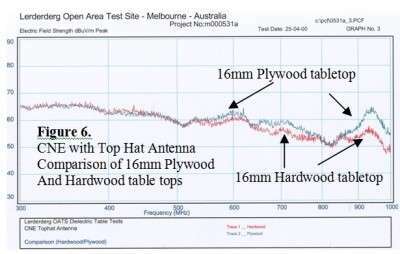 Differences of up to 10 dB in received field strength were measured between fibreglass and hardwood tabletops. The results show that the perturbations caused by the dielectric loading of the transmit source are significant and cannot be ignored. The dielectric loading of the transmit antenna was found to increase as the relative permittivity of the table material increased. For frequencies above 300 MHz, the dielectric increasingly effected the radiation properties of the EUT, particular when the EUT was moved closer to the surface of the table. The major impact on radiated field strength reproducibility is therefore expected to be on high frequency sources and on radiating sources, such as EUT cables, that are in close proximity to the dielectric EUT table. Significant differences were also recorded between different types and thicknesses of wood, fibreglass and PVC. The differences were generally larger than the absolute measurement uncertainties for field strength and hence should not be ignored. The effect of the table is therefore important when performing radiated emission and immunity Round Robin comparison tests. 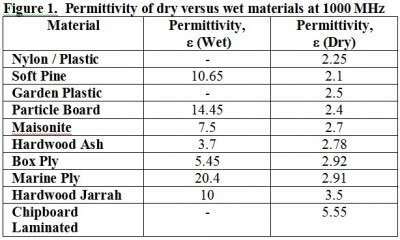 The relative permittivity of the different EUT table materials was measured and found to vary significantly. The differences were even greater when the materials were wet. While slight variations in permittivity did not cause significant degradation of the field measurements, the use of thick tabletops had a major influence. In general, the measured field strength diminished with increasing permittivity and increasing thickness. The use of wet or damp EUT tables will result in more pronounced dielectric effects and field disturbances. As it is now common for ITE to operate at frequencies above 1 GHz, the wooden EUT table should no longer be assumed to be RF transparent. This study shows that when the EMI source is placed on the wooden EUT table and when EMI frequencies exceed approximately 300 MHz, the dielectric loading of the transmit source will begin to have a significant effect on the measured field strength, particularly for horizontally polarised radiating sources. The effect is worse when the EUT table is wet. Some CISPR standards now require measurements up to 18 GHz while ANSI C63.4 requires measurements to 40 GHz. The influence of the tabletop dielectric will be even greater above 1 GHz and it will have a major impact on measurement reproducibility. The differences caused by the different dielectric materials can actually be larger than the absolute measurement uncertainty that is achieved by most test laboratories. This factor could explain some of the measurement reproducibility problems identified in Round-Robin measurement proficiency tests. The results in this study also highlighted a major deficiency in the current measurement standards. In order to improve measurement reproducibility between test sites, it is recommended that the dielectric characteristics of the EUT table be adequately defined, and that the effect on the measurements be included in the uncertainty budget. Wet weather measurements should not be allowed without adequate precautions. C.I.S.P.R. Publication 16-1: Specification for radio interference measuring apparatus and measurement methods. Part 1: Radio disturbance and immunity measuring apparatus. – Central Bureau of the IEC, 3 rue de Varembe, Geneve, Switzerland, 1998. C.I.S.P.R. Publication 22: Limits and methods of measurements of radio interference characteristics of information technology Equipment- Central Bureau of the IEC, 3 rue de Varembe, Geneve, Switzerland, 1997. C.I.S.P.R Publication 13: Limits and methods of measurement of radio interference characteristics of sound and television broadcast receivers and Associated Equipment. – Central Bureau of the IEC, 3 rue de Varembe, Geneve, Switzerland, 1998. If you require EMC radiated emissions testing or radiated field strength measurements on our ANSI C63.4 compliant iOATS test site that doesn’t use a wooden table or similar please contact us for further details.